India has a lot of ancient monuments this is obviously one of the best according to the Archaeological Survey of India, do you suppose that is because toilets in India are so few and far between? 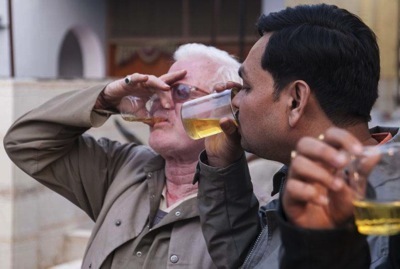 Booze with a bite from India! Are you brave or just plain silly to drink this beer? Are the pedestrians about to overtake the car? Mind you the driving lessons must be good value for money because the car has three people in it, one teacher and two pupils? Or is that two teachers and one pupil? 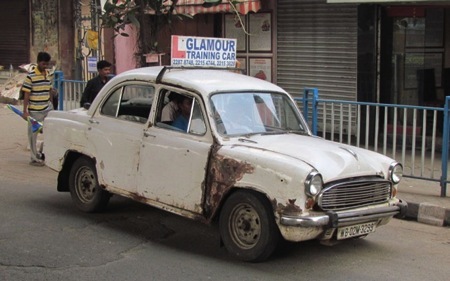 I have to say I do like the bonnet (hood to my American readers) it looks nearly new doesn’t it, probably only 50 years old. 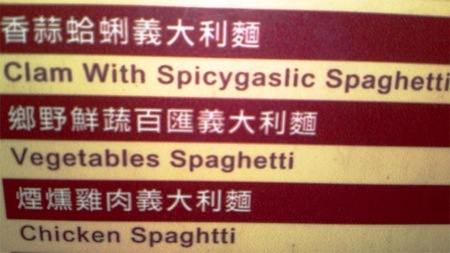 As the title says, I fancy some Spicygaslic Clams, sadly I would have to travel all the way to Taipei! 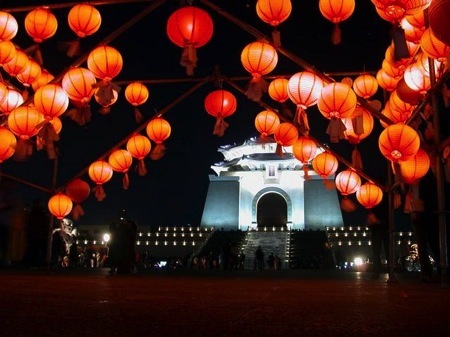 But then I bet it would be worth it just for the Clams because there isn’t much else to see, well apart from the Lantern Festival, which looks rather cool, oh and the stern looks of the Chinese in their gun turrets which are trained on the island from across the narrow stretch of water that separates them. Whine a local India speciality! 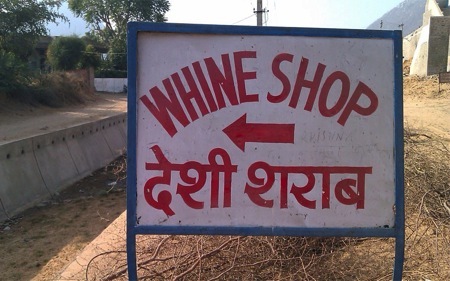 In Pushkar, India you are in for a very special surprise if you fancy a whine! Unless this shop sells something else and all that comes to mind are the noises of jet engines or long moans! Whatever happened to the Lehman Brothers? 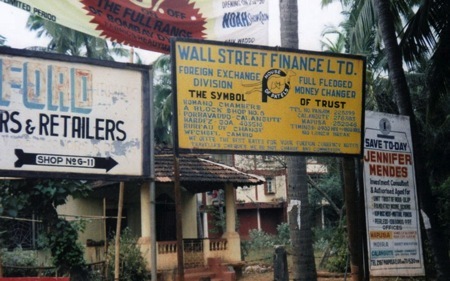 The answer to the question whatever happened to the Lehman Brothers is simple, they set up shop in Goa! Wall Street Finance, really did they think that would fool us? Tee hee! Southall UK, it’s like little India with freshly squeezed 100% Cok! As seen in a corner shop in downtown Southall, London opposite the Bollywood style cinema and in the shadow of a Mosque’s minaret. You are probably not going to believe this! 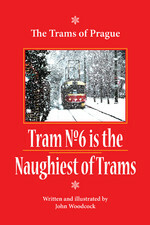 As the title of this blog says you are probably not going to believe this! And I don’t blame you if you don’t, but the camera never lies so I have added more than the usual daily dose of photographic evidence you’ll be delighted and revolted to see! Ok so who in their right mind would drink cow urine? Indeed who in their right mind would believe that cow urine is a form of amazing medicine? All of which you will see leads me to ask who in their right mind would live in India? 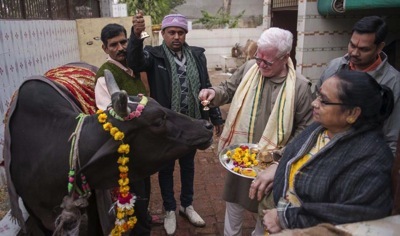 A bewildered group of Hindu worshippers in India claim that drinking fresh cow urine will help cure them of all diseases cancer, diabetes, tumours, tuberculosis, stomach problems and much more. They also claim that drinking cow pee is the only effective solution for treating baldness. These confused Hindus believe the cow is a holy animal and say that cow urine has divine healing properties! Of course it does! Doesn’t it boys and girls? 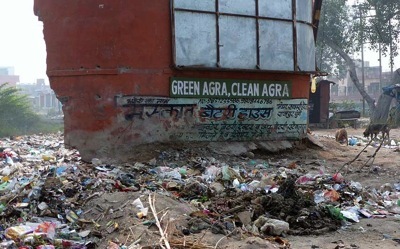 Just to be clear this is where cow urine, especially the fresh stuff, comes from and gulp it’s collected! So who’s for a cup of cow pee? Even the little calf has enough sense to look embarrassed and turn away from the camera to preserve his dignity. This last picture may or may not have something to do with odd goings on above, frankly I don’t know, but I thought I would include it just to demonstrate exactly how much the strange fellows from India like their cows and would rather dress them up in garlands of flowers than do the same for their women. Quite why the clown in the Justin Bieber hat, and white winklepickers is ringing a bell over the cow’s head I have no idea and no wish to speculate, and if the other idiot with the little copper jug of water thinks that the cow is going to quench its thirst from the contents then he really should see a doctor and not a cow! Just be thankful that I didn’t include pictures of these mentally challenged folk toasting the camera with a glass of fresh, steaming, ‘delicious,’ curative… well you can guess what can’t you! Oh do please give me a Taco which is hand rolled with exotic Mexican spices by genuine Mayan virgins or Carlos, depending on who’s available. 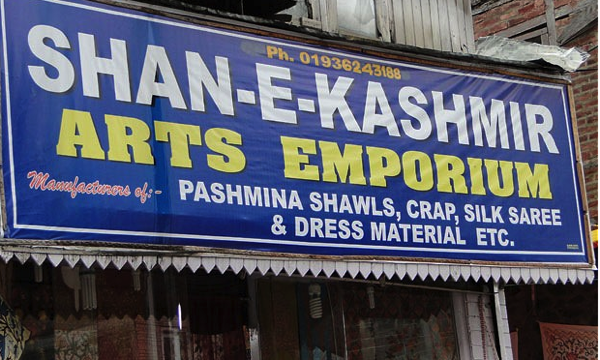 First of all before I start on any jokes or poke fun at Mr. Shan and his ‘Arts Emporium’ I would like to thank him for his honesty, at least if you are tempted to enter his emporium you know that all of his merchandise is “crap” it says so on the sign above the entrance. Sadly the sign doesn’t elaborate about the conditions the workers producing this crap endure, their low wages and the fact that when the building they are working in collapses on top of them, the west will surely pick up the bill! But hey, the sign is just not big enough and that’s not Mr. Shan’s fault is it? Now I promised a joke, but when employers treat their employees the way the Mr. Shan’s of the world in India, Bangladesh and Pakistan and other totally uncivilised countries treat their employees I find it rather difficult to be funny, yes even me!